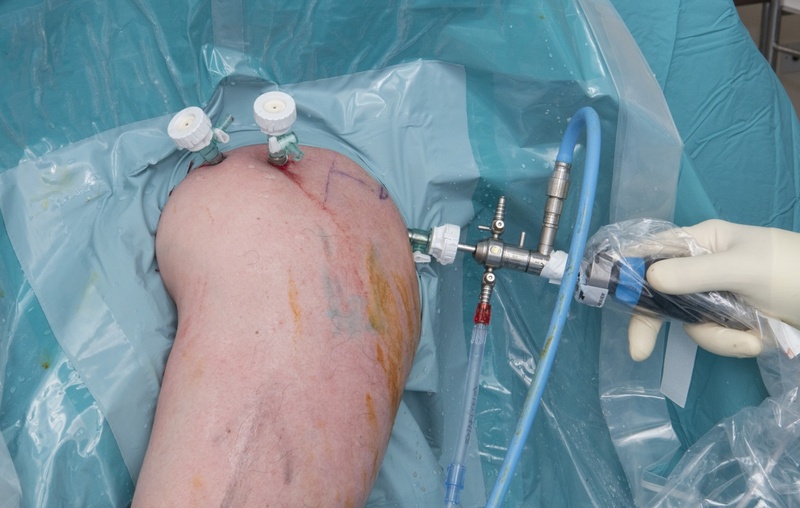 Learn the Arthroscopic resurfacing of the glenoid with Graft-jacket dermal allograft(Wright medical) and Q-Fix anchors (Smith & Nephew) surgical technique with step by step instructions on OrthOracle. Our e-learning platform contains high resolution images and a certified CME of the Arthroscopic resurfacing of the glenoid with Graft-jacket dermal allograft(Wright medical) and Q-Fix anchors (Smith & Nephew) surgical procedure. Osteoarthritis of the shoulder in young patients is challenging to treat with no ideal solution. Joint replacement is the end option but the choice of replacement has also generated controversy. Studies in older patients have shown a better result after total shoulder arthroplasty compared with hemiarthroplasty with regard to motion, pain relief, and the need for early revision. However, in these young, active patients glenoid loosening, eccentric wear of the prosthetic glenoid, and the potential need for multiple revision surgeries has led many authors to recommend only humeral head replacement at the initial surgery. Hemiarthroplasty is also not the ideal solution as glenoid erosion and subsequent pain can lead to early revision, which is then more challenging as a consequence of the bone loss. Burkhead and colleagues addressed these concerns in their report of a technique of humeral head replacement with biologic resurfacing of the glenoid with a soft-tissue graft. Their results in 6 patients with 2 years’ follow-up showed excellent results in 5 and a good result in 1. A variety of grafts have been used ranging from facia lata to lateral meniscus allograft. Krishnan et al. recently published their results with 2 to 15 years’ follow-up in 36 shoulders in 34 patients treated with biologic glenoid resurfacing in combination with hemiarthroplasty; 31 of 36 achieved satisfactory results. In an attempt to avoid replacement all together, and find a less invasive solution, arthroscopic procedures have been undertaken rangeing from debridement to capsular release. However previous studies have shown that techniques involving debridement alone are more likely to result in inferior results with an increasing severity of arthritis. Resurfacing of the glenoid using human dermal allograft has been attempted by a number of authors in order to improve upon the results of debridement in isolation. Essentially it is a form of Autologous Matrix Induced Chondrogenesis(AMIC), the glenoid is microfractured and covered with a dermal allograft with the aim of achieveing a fibro-cartilagenous repair that will improve pain and function. Author : Professor Martyn Snow FRCS (TR & Orth). Institution :The Royal Orthopaedic Hospital Birmingham, UK. Author: Author : Professor Martyn Snow FRCS (TR & Orth). Institution: Institution :The Royal Orthopaedic Hospital Birmingham, UK.